Visit The Dirt Chronicles FaceBook page. 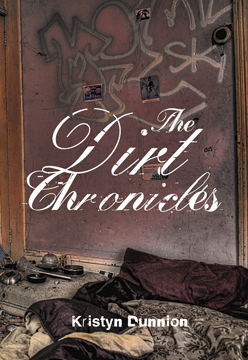 Queer hustlers, anarcho-punks, rural burnouts, and teen runaways feature prominently in the intense reality of The Dirt Chronicles, Kristyn Dunnion’s stunning debut story collection. In these linked tales, urban outlaws in Toronto map out their plans to take over the world while living collectively in an abandoned chair factory, destined for demolition according to a real estate gentrification plan. Their community is infiltrated by the King, a dirty cop bent on obliterating the city’s defiant underclass and exterminating the group’s rogue members; in order to survive, they may have to betray what they value most: autonomy, friendship, and newly discovered concepts of freedom. Audacious and loud, The Dirt Chronicles is a thrashing three-chord rejection of mainstream culture and the powers- that-be, and a combustible homage to class rebellion. Order The Dirt Chronicles online here!